The 49th meeting of the season, held yesterday afternoon, heralded the start of the Prix De Vincennes championship for French trotters in the Premier Class. The programme consisted of 10 races, all for trotters. The Premier championship heats were won by Quo Williams, Quiet Du Chene and Roseau Du Hamel. From the three heats, held over on a long distance of 2,640 metres, 12 horses qualified for the final stage of the Prix De Vincennes. In the first heat, Quo Williams, under the guidance of Charles Camilleri, nosed ahead around 500m from the finish. This 11-year-old trotter succeeded in securing its first win at the racetrack, easily by a length-and-a-half from runner-up Qui Sait (Rodney Gatt). Quillian Joyeux (Andrew Farrugia) was third ahead of Petunia Du Pont (Clint Vassallo). The early leader in the next Premier heat, Quorum Quick (Brian Zammit), started to slow down when the front horses approached the final straight. Quorum Quick was reeled in by Quiet Du Chene (Mario Fenech) which cruised to its second win this season. Reve De L’Odon (Shaun Portelli) and Quesito d’Or (Frenċu Cassar) followed behind in that order. A keen tussle between four trotters developed in the straight for home in the remaining champion-ship heat. At the post, it was Roseau Du Hamel (Paul Galea) which lived up to expectations and maintained its successful streak by grabbing its third win in a row and fifth this year. Pedro Vici (Johan Axisa) was the runner-up ahead of Rio De Lou (Marvin Cauchi) and Quetzal De Brix (Clint Vassallo), the last horse to make it to the final. 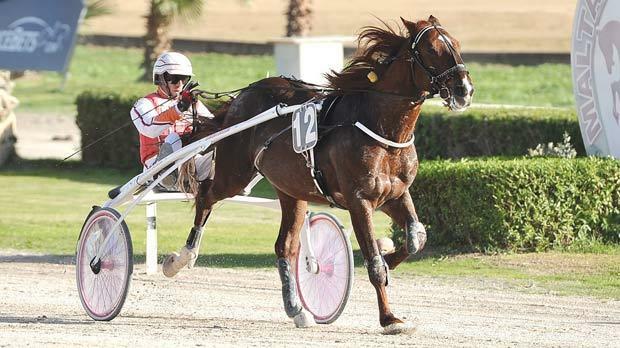 Yesterday, the card also in-cluded four semi-final races from two other championships for French trotters. These were the Prix d’Enghien for Gold Class and the Prix De Cabourg for Silver Class. In the first Gold semi-final, Michael Ellul put Quefi Des Caillons in front with a lap to go and this trotter went on to claim its third win at Marsa from Phenix De La Roque (Noel Baldacchino). Ourasi Diams (Emmanuel Fenech) was unchallenged for the entire 2,640m distance in the other Gold semi-final. Ourasi Diams raced past the post first, some five lengths in front of Tresor De Quesny (An-drew Farrugia). Another meeting at the racetrack will be held next Sunday afternoon.